On the Friday preceding this year’s 24 Heures du Mans Ferrari presented a special edition of the 488 Pista on their stand in “The Village” at the track. 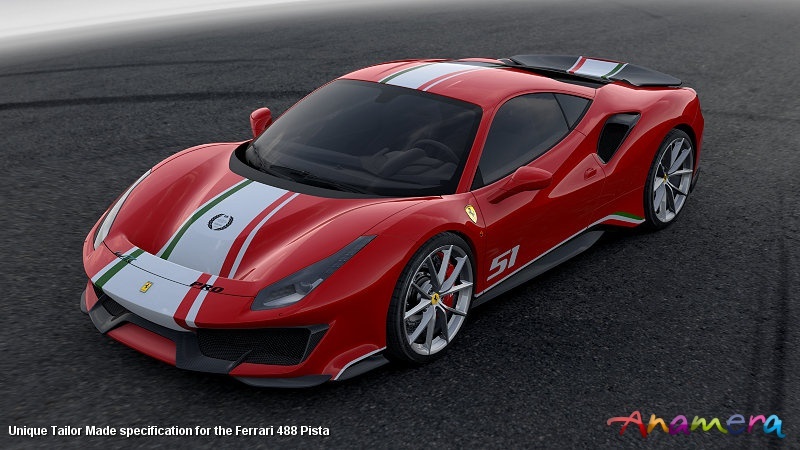 The new addition to the range was the 488 Pista “Piloti Ferrari”, which is available exclusively to clients involved in the company’s motor sport programmes. The new model was presented by Enrico Galliera, Ferrari’s ‎Senior Vice President direzione commerciale e marketing, and was unveiled by five of their GT drivers, Sam Bird, James Calado, Miguel Molina, Alessandro Pier Guidi and Davide Rigon, who collectively removed the red drape to present the car to the public for the first time. They then all autographed the carbon fibre engine bay trim. Also in attendance at the unveiling ceremony were Antonello Coletta, head of Ferrari’s Sporting Activity Department, Amato Ferrari, head of AF Corse, and Pierre Fillon, President of the Automobile Club de l’Ouest. The look of the new model is inspired by the Italian Tricolore livery of the # 51 AF Corse entered 488 GTE, which ran in the 2017 FIA WEC LMGTE PRO class. This car took James Calado and Alessandro Pier Guidi to the GT FIA World Endurance Drivers’ Championship, taking the GT FIA World Endurance Manufacturers title for Ferrari, and the FIA Endurance Trophy for LMGTE PRO Teams for AF Corse. As part of the tribute to these championship victories, the cars in the series have permission from the FIA to wear the official WEC script logo on the nose, and also carry the 2017 Manufacturers’ winning laurel wreath on the front lid. The presentation car, chassis # 237115, finished in Rosso Corsa, carried the race # 51 as used on the championships winning car. Apart from Rosso Corsa, the car will be available in three other colours, Blu Tour De France, Nero Daytona and Argento Nürburgring, and the clients can add their own personal race number to the sides of the car, which also feature the Italian Tricolore on the lower forward section of the rear wheel arch. The “floating” rear spoiler is finished in bare carbon fibre as opposed to the normal body colour finish on the regular Pista. Inside the cockpit, the seats are trimmed in black Alcantara, featuring a special perforated version of the same material to the centre sections of the seat squab and backrest, the latter featuring the Italian Tricolore, as do the complimentary floor mats. The play on Italy’s national flag is completed by a Tricolore finish to the tips of the gearshift paddles, whilst the client’s “race Number” also appears on the lower section of the steering wheel. The bespoke interior is completed by an identification plate on the rear cabin firewall between the seats, and a carbon-fibre sill kick plate featuring the “Tailor Made” logo.